Global Powers of Retailing is a report by published by Deloitte each year. The report identifies the 250 largest retailers worldwide based on publicly available data. The latest report was released in 2018 and is for FY2016 (fiscal years ended through June 2017). According to the report, overall, Brexit is having a detrimental effect on some European economies to struggle, particularly the United Kingdom, and there are weak performances by some big European-based retailers in recent years including the grocery sector. Europe’s share of Top 250 revenues has dropped from 39.4 percent to 33.8 percent in just 10 years. However, according to the report, Europe overall has shown accelerated growth while it has lost ground to the Asia-Pacific region and other emerging markets. For the grocery sector, digitalization is firmly entrenched and global grocery sales through e-commerce channels increased by 30 percent in the past year. The United Kingdom was one of the leading countries fueling that growth (+8 percent) but China (+52 percent) and South Korea (+41 percent) were the biggest contributors. Brexit has had a profound effect on the United Kingdom. There was a decline in the value of the pound, although it has recovered slightly, leading to higher import prices. Inflation has caused a decline in consumer spending, and retail sales have faltered. Many companies are shifting jobs to the continent because of the uncertainty caused by Brexit and the modest growth outlook for the United Kingdom. The Eurozone economy, however, is showing robust growth particularly in Germany, Spain, and the Netherlands. France is economically sound, and Italy is starting to show signs of improvement, all of which bodes well for Europe's retailers. Digital transformation is the focus of the latest Global Powers of Retailing report because omni-commerce is now representative of the retail industry. For example, the French grocer Auchan is working with the Chinese e-commerce technology platform Alibaba to meld their respective offline and online expertise and leverage new retail opportunities in China’s food sector. 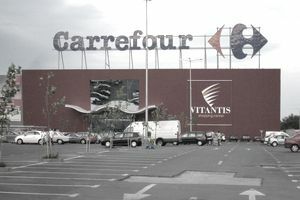 Also, the French supermarket chain Casino is partnering with the online retailer Ocado to use Ocado's technology platform and initiate e-commerce business in France. In Spain, DIA is partnering with online discount retailer MeQuedoUno to expand its e-commerce activities in electronics and other household goods. In the United Kingdom, the grocer Morrison's, aided by Amazon, brought one-hour grocery delivery to London's shoppers. As the growing grocery delivery trend suggests, grocers and retailers are transitioning from providers of goods to purveyors of services and solutions, and not just where food is concerned. Many are offering health and wellness services in the form of in-store health clinics and on-site nutritionists and dietitians. In the United Kingdom, Debenhams is trialing fitness centers by partnering with the gym company Sweat! In the world of fashion, Spain’s Inditex (Zara) and Sweden’s H&M have each seen double-digit growth annually during the last five years. Recent transformations in the retail industry include the effect of the Internet of Things, artificial intelligence, augmented and virtual reality (AR/VR), and robots, which are all major disruptors of the retail industry. German consumer electronics retailer Ceconomy, a 2017 spin-off from Metro, has launched a VR application that allows shoppers to browse for 100 selected products in two virtual environments. Spain’s El Corte Ingles uses a VR app to take shoppers on a wine journey promoting its Rioja wines. In-store robots are being trialed by several retailers to handle routine and mundane tasks and improve efficiency and service levels. In Denmark, the supermarket Coop is experimenting with unmanned store pilots. Below is a complete list of European retailers ranked in the top 100 by the 2018 Global Powers of Retailing. The number in the left column is the global ranking number assigned to the company, based on its revenue figures, compared to the other 100 largest retail organizations worldwide. For a complete list of the retailers ranked in the top 250 global retailers, refer to the list in the Global Powers of Retailing. 35 LVMH Moet Hennessy Louis Vuitton S.A.
56 Jeronimo Martins, SGPS S.A.
71 El Corte Ingles, S.A.